Export Kit Pro provides additional options for customization of you project and file outputs. You can customize both layer and document functionality, along with custom scripting for automated outputs. Your customization will individualize your project and output. The options included in Export Kit Pro will allow for full flexibility when creating interactive projects for use on desktops and mobiles. Learn more about using Exports Panel before using the Pro features. You MUST click Customize to enable the Pro features of Export Kit. 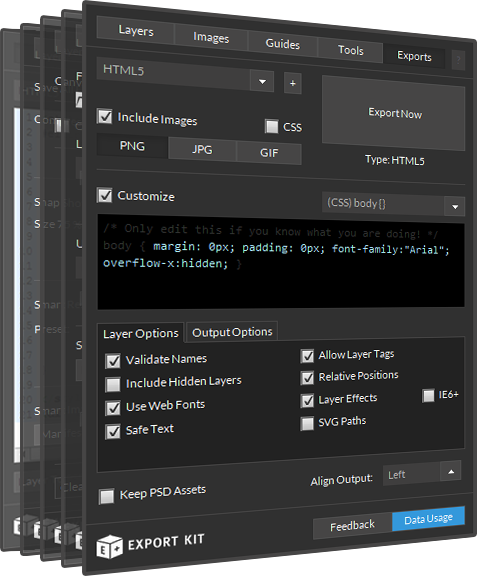 Each Output in Export Kit allows you to customize content relative to the code environment. Click the Edit dropdown menu to select a output content to modify. Once you select your desired view content to customize, you can edit the content directly in the Edit Area. NOTE: All changes are saved automatically. IMPORTANT: You must keep your mouse INSIDE the text edit area to avoid activating Adobe shortcut keys. When you install your web-templates, you can access any template library directly inside Export Kit. Each library will enable custom options created by the developer for use with your export. IMPORTANT: You must install web-templates before using this feature. Once you select your template, you MUST enable the template before modifying options. Only templates which are ENABLED will be included in the output. This makes it easy to use only specific templates when required. When your template is enabled, you can easily modify any custom option to personalize your output scripts. Each option is specific so you may need to read the instructions included with the template or consult a developer. You can customize how Export Kit processes each Photoshop, Illustrator or InDesign layer when exporting using the Layer Options tab. Read more about using Layer Options. You can customize how Export Kit will treat the Photoshop, Illustrator or InDesign document when exporting using the Output Options tab. Read more about Output Options. 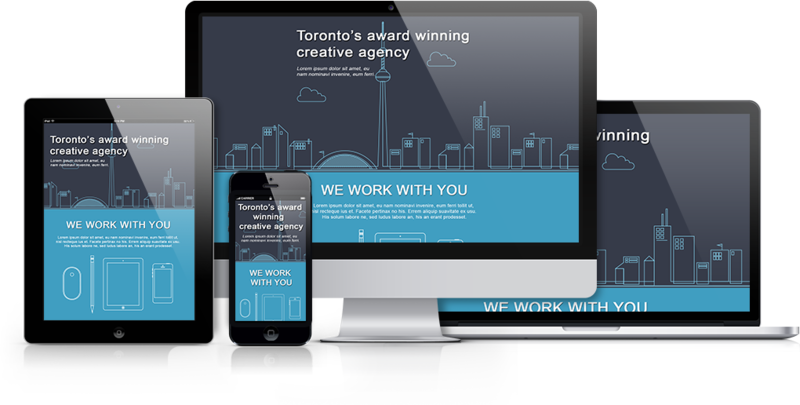 Customize where the content is aligned in your Output based on the user screen size. Align Output supports left, center and right align. IMPORTANT: You can only use this option if the Document size is LESS than the user screen size. Read more about how to use Align Output and Hide Overflow with your Output. 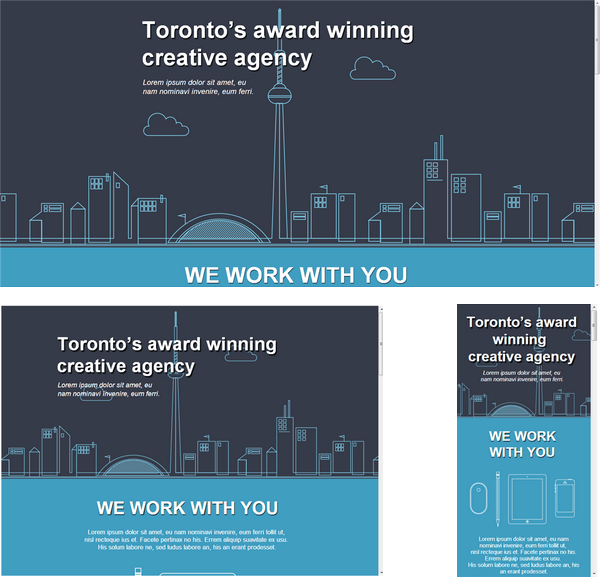 NOTE: Each folder in your document will save as an individual PSD, AI, or INDD file. At any time you can save your custom options and settings for reuse. This removes the requirement of reselecting your options each time you load the plugin. Give your new custom options a name, press Save and reload the plugin. All options are stored in your export-options folder for easy reference and modification.